Growing a beard is truly one of the manliest endeavors a gentleman can pursue. But all too often, we see a tragic waste of potential bearded talent, because so many men are put off by one question:Â how long will it take to grow my beard? The answer, as with all things, is really that it dependsâ€”and weâ€™ll explain in a minute. But youâ€™re a busy gentleman, and you donâ€™t have time for â€œit dependsâ€�. Thatâ€™s fine. So hereâ€™s a quick answer:Â to get your full beard can take anything from two months up to sevral years. But keep reading, and youâ€™ll see why. Now, obviously, the first thing that beard growing time depends on is the length of your final beard. If you simply want to sport a dashing, close-cropped â€˜officeâ€™ beard, then it will hardly take a few months to get to where you want to be. But if you desire a glorious, full-strength tapestry of gentlemanhoodâ€”well, thatâ€™s something that will come with time. And if maximum length is your object, your limitâ€”and the time it will takeâ€”will be mainly determined by your genetics. Every hair begins in the anagen phase, grows until the catagen phase, and then falls out in the telogen phase. And therefore, since hairs are only growing during the anagen phase, your beard is only growing during that phase too. In other words, however long the anagen phase lasts for the hairs in your beard is how long your beard will grow for. Well, you ask, just how longÂ doesÂ the anagen phase last for? Fine question. It turns out that it can last for between 2-7 years, depending on the person. And therefore, bearded-sir-to-be, your future beard will reach its maximum lengthÂ between two to seven years. Remember, weâ€™re discussing theÂ maximum lengthÂ here. 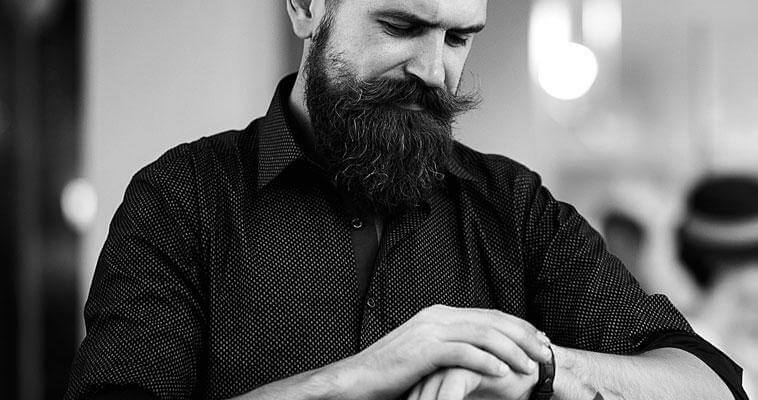 A very handsome beard can be achieved in as little as two months, and with proper usage of a good beard trimmer, it will look just great.Â But if the length is your goal, prepare to be in for the long haul. Now, since the length of the anagen phase varies from person to person, this also simply means that, for better or worse,Â some men can just grow longer beards than others. But note this caveat: since follicles grow until the catagen phase, if your beard is not yet consistently shedding hairs, donâ€™t give up. Hairs may fall out here and there, and some at different lengths to others: but until your beard is consistently dropping hairs, you havenâ€™t yet reached your maximum potential. Hang in there. Unfortunately, there are no tricks to make your beard grow faster. So, tip your hat to the next full-bearded man you see: that beard was crafted through dedication and patience. However, there are things you can do to help your beard grow as quickly as it canâ€”and a dedicated bearded man will always strive to his utmost to pay attention to them. Firstly, a bad diet or unhealthy lifestyle will hinder good beard growth. Factors such as weight, poor eating choices, lack of sleep or no exercise are all detrimental to not only your beard, but also the skin beneath it. So not only for the sake of your beard â€” but also for the sake of a long, pleasant life to enjoy it â€” ensure you lead a wise, healthy lifestyle. Itâ€™s not easy, but then again, being a gentleman of class never was. Another tip that will greatly help your beard growth is to use proper beard care products to protect and nourish the follicles as they grow, and moisturize the skin beneath to avoid irritation. At Mister Shaver, we recommend using the finest beard oils and balms for just this purpose. Using a few drops of beard oil a day, even from an early stage, will go a long way to ensuring smooth, comfortable beard growth. Itâ€™s easy to be intimidated by a figure of several years to grow a beard. But regardless of its ultimate length, remember, you can be sporting a beautiful beard in just one to two months. From there, itâ€™s just a matter of going from a good beard to a great one. And given a good diet, a healthy lifestyle, and proper quality beard care to nurture your beard along the way, you too can soon enjoy a beard thatâ€™s the envy of all your acquaintances.